It is a real pleasure for me to attend the Times CEO Summit on Africa and share with you my views on what we can do to help Africa. Africa was an important part of my diplomatic career. My first posting as a young diplomat was in Zambia, a southern African country and my first ambassadorial post was in Egypt, a northern African country. I became attached to the continent and have followed its development closely. Africa has been doing well in recent years, with annual growth of over 4%. Yet, Africa still confronts many challenges, from economic slowdown to frequent natural disasters, falling food production and environmental degradation. The international community is duty-bound to help Africa grow its economy, reduce poverty and attain the Millennium Development Goals. First, long history. China's interaction with Africa is by no means something new. Over 600 years ago, Admiral Zheng He, the famous Chinese navigator, reached East Africa 4 times. China firmly stood with its African brothers in the 1950s in their independence struggle. China-Africa partnership has since stood the test of time and gone from strength to strength. Second, selfless assistance. China started to offer assistance to Africa from the second half of the last century despite serious economic difficulties at home. I personally witnessed the inauguration of the Tanzania-Zambia Railway, an example of China's selfless assistance and a symbol of China-Africa friendship. Even today there is a cemetery in Dar-es-Salaam where Chinese railway engineers and workers were buried. China has since provided assistance to 53 African countries and helped build more than 900 projects. A total of 17 thousand Chinese medical workers have been sent to Africa over the past decades. From 2000 to 2009, China cancelled 312 debts owed by 35 African countries with a total value of 18.96 billion RMB (nearly 1.9 billion pounnds). China also offered scholarships to over 30 thousand African students and trained more than 30 thousand African professionals. Third, equality and mutual benefit. China and Africa respect and support each other politically. China never imposes its will on Africa countries. China-Africa economic and business partnership is an example of South-South cooperation, covering extensive areas of trade, investment and infrastructure development. China became Africa's No.1 trading partner in 2009. Two-way trade has since exceeded 100 billion US dollars. China signed bilateral trade agreements with 45 African countries. China-Africa trade is by no means all about energy and resources. Trade has become more balanced in recent years. Industrial and agricultural products of Africa are increasingly popular among Chinese customers. Two-way investment has exceeded 10 billion US dollars. Take Zambia as an example. 13 companies have settled in the Zambia-China economic and trade cooperation zone, the first of such zones in Africa, with paid-in investment of 600 million US dollars and creating more than 6,000 jobs. Such a model of investment is being applied in other parts of Africa, such as Mauritius, Nigeria, Egypt and Ethiopia, as it contributes to the local economy by forming a cluster of businesses and increasing their efficiency. Chinese businesses are also playing an active part in Africa's infrastructure development, building houses, water and power supply, and communications facilities to raise local people's living standards. In the past decade, China built 60,000 kilometres of road and 70 million square metre of housing for Africa. Many of these projects are built with Chinese financial support. Fourth, openness and transparency. China-Africa cooperation is not exclusive, nor is it a tool of "neo-colonialism". In recent years, EU proposed the idea of trilateral cooperation between China, Africa and EU. We are open-minded to the proposal. As a matter of fact, there is no lack of such trilateral cooperation – China has many projects in Africa in collaboration with the UN Food and Agriculture Organization and the World Bank. We hope that such cooperation will follow the following principles: One, African countries' wishes should be respected; Two, no party should set the rule of the game unilaterally; Three, such cooperation should be efficient and serve Africa's development; Four, cooperation should be carried out on a voluntary basis, and proceed in an orderly way with easier areas first. China is the largest developing country in the world, while Africa is home to the largest number of developing countries. One has one fifth of the world's population, the other one seventh. Mutually beneficial cooperation not only serves common prosperity and development of China and Africa, but also contributes to peace and stability of the world. Let us work together, help Africa to grow and contribute to a peaceful and prosperous future for the continent. On 22 March, The Times hosted The Times CEO Summit: Africa in London. Present were President Kagame of Rwanda, President Bongo of Gabon, Foreign Secretary Hague and about 200 international political and business leaders. 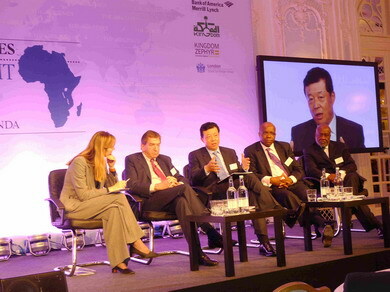 The Summit discussed Africa's economic landscape and future. Ambassador Liu Xiaoming attended the Summit and made the above remarks. He also answered questions such as China-EU-Africa trilateral cooperation during the panel discussion.